If you want a single lens that can cover every imaginable shooting situation, from wide-angle groups to ultra-high-power zoom shots, look no further than the new AF-S DX NIKKOR 18–300mm f/3.5-5.6G ED VR. Boasting the longest reach of any NIKKOR all-in-one zoom lens, it delivers the equivalent of 450mm—enough reach to bring the most distant action up close. Nikon's second generation VR II technology ensures every photo and HD video is razor-sharp, and Nikon's advancements in lens design deliver consistent, exceptional performance in any setting. It's also great for close-up shooting. Even more amazing, the AF-S NIKKOR 18-300mm f/3.5-5.6G ED VR does all this in a surprisingly compact, lightweight lens. Building on the success of the AF-S DX NIKKOR 18–200mm f/3.5-5.6G VR, Nikon proudly introduces the AF-S DX NIKKOR 18–300mm f/3.5-5.6G ED VR for those who want even more reach in an all-in-one lens. Its astounding 16.7x zoom range goes from a wide 27mm equivalent, great for group shots, vast landscapes and more, all the way to a super-telephoto 450mm equivalent, enough reach for wildlife photography and more. The lens can focus as close as 1.48-ft. from your subject at 300mm. This ultra-high-power zoom capability means no subject or composition will ever be out of reach again. At super-telephoto focal lengths, even the slightest camera movement can cause image blur. Fortunately, the AF-S DX NIKKOR 18–300mm f/3.5-5.6G ED VR features Nikon VR (Vibration Reduction) image stabilization that provides 3.5 stops* of blur free handheld shooting, assuring dramatically sharper still images and HD video capture. Nikon's innovations in optical design and lens technology have given way to a remarkable new class of NIKKOR lenses. 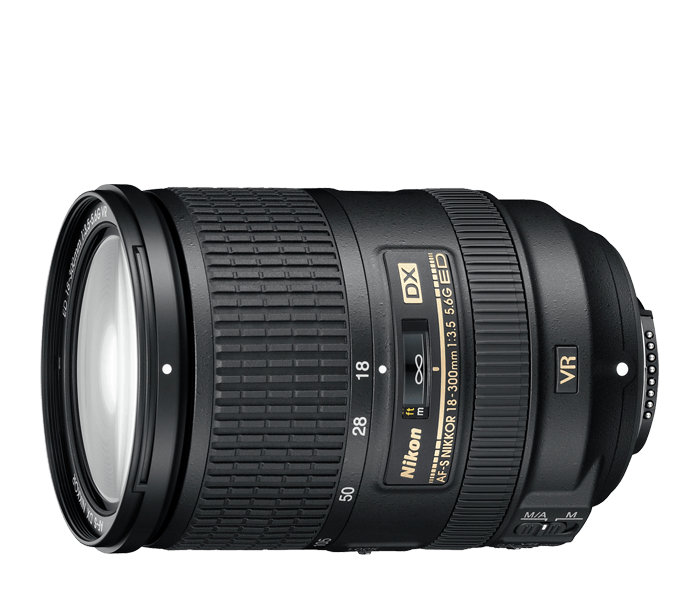 The AF-S DX NIKKOR 18–300mm f/3.5-5.6G ED VR is among them. From its Silent Wave Motor (SWM) for ultra-fast, ultra-quiet autofocusing to its Aspherical (AS) lens elements and Extra-low Dispersion (ED) glass elements for maximum contrast and minimum lens flare and ghosting—you can expect a lifetime of consistent brilliant performance from the AF-S DX NIKKOR 18–300mm f/3.5-5.6G ED VR.